OK, So was it man-flu, or maybe the need for a much-needed post-lunch siesta which led to so many of our members taking up a horizonbtal position during our annual singing retreat? The event, held every year just before Easter, is an opportunity for members of Capital Chorus to take a weekend away together and work on aspets of our performance skills, and this year our guest-coach, Simon Arnott, was keen to demosnstrate the power which the correct singing posture could add to our voices. As Simon told us, with singing the alignment of the body to its optimum position is particularly important. Paying close attention to the position of the feet, knees, hips, abdomen, neck and head can improve the sound, while using the abdominal muscles to support breathing can help sustain notes and prevent singers from "trailing-off" at the end of phrases. 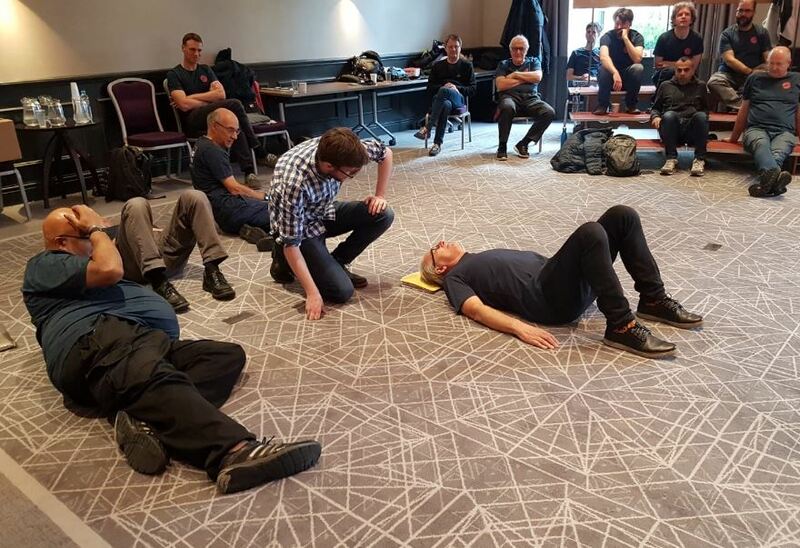 One way of helping to find the best possible alignment is to lie down, using the floor for support - it certainly gave us a new perspective on our hobby, and it was remarkable how much diffierce it could make to the strength and clarity of individual performers. 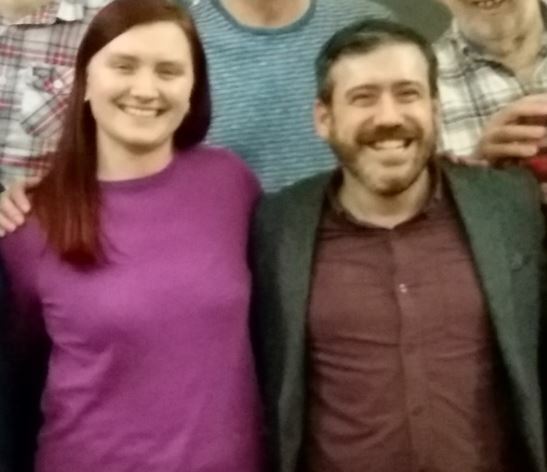 As a singer, composer, arranger and director of two exceptionally-talented and successful choruses, Meantime and the London City Singers, Simon Arnott brought a wealth of experience to share with us. He and our own musical direcdtor, Pippa Goodall, worked us hard during a very rewarding two days at our retreat hotel just outside London. This was our fourth annual chorus retreat. Past coaches have included some of the most well-known and accomplished names in British Barbershop including John Palmer, Zac Booles and Kirsty Williams, and after the day's efforts are completed there is always plenty of time during the evening to relex, socialise and maybe even sing some more. As one of West London's leading male-voice a cappella choirs we'll certainly be putting what we larned from Simon to good use when we appear at upcoming events including The London Marathon and Ham Fair, We're also hoping the weekend will help us perform well in one of the highlights of our year, the men's chorus contest at the annual convention of the British Association of Barbershop Singers, which takes place in Bournemouth at the end of May. 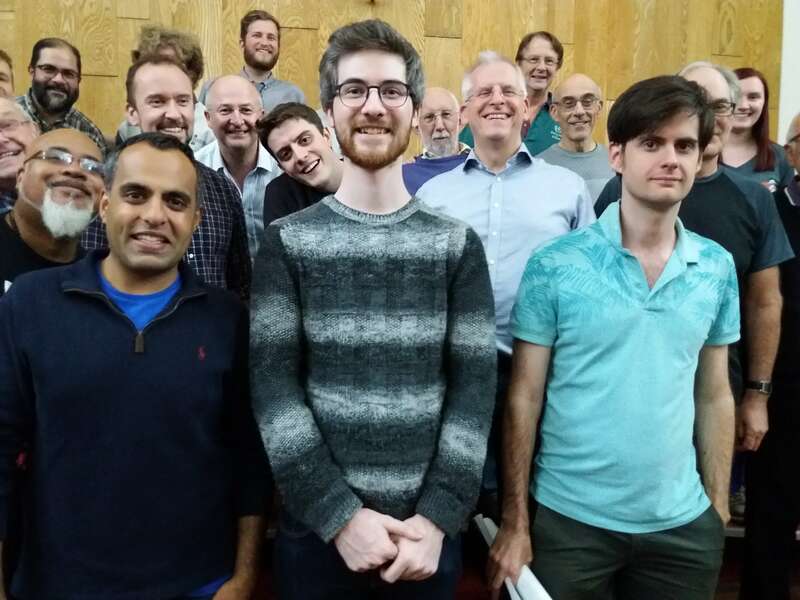 This year Capital Chorus marks 35 exciting years as one of the leading choirs for men in West London, singing close harmony in the Barbershop-style.. The early days saw the chorus rubbing shoulders with American diplomats, breaking singing taboos on the London Underground, and experiencing the odd fashion disaster, But the spirit of commitment to performance, the craft of singing, and to having fun were there from the very start. In the following article our Chairman, Paul Gordon, himself a founder member of Capital Chorus, reflects on how it all began. 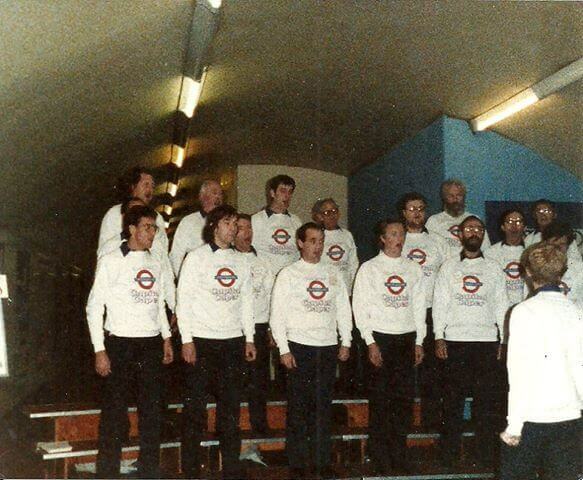 Our story starts in the summer of 1983 when Phil Jones, a member of the Carshalton Barbershop Harmony Club, decided to try to start a chorus in the West London area near his home. He contacted Ian Stone, the British association of Barbershop Singers (BABS) membership secretary, who was singing with the Chesham Barbershop Harmony Club. 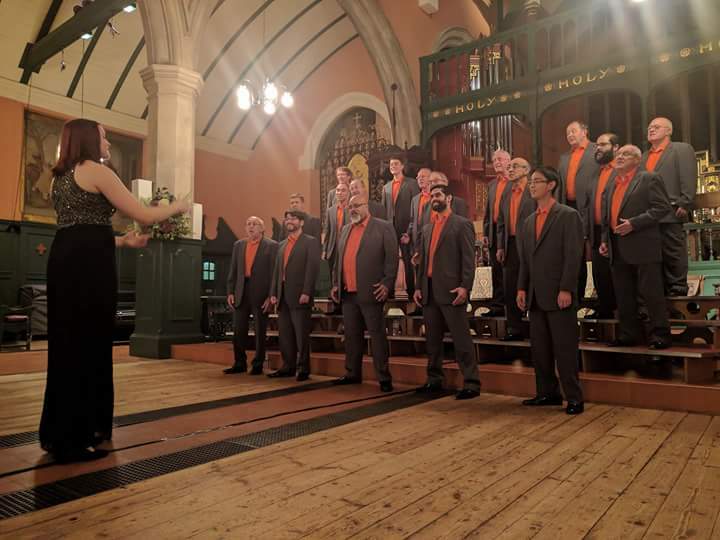 The “Dynamic Duo”, together with some other barbershop singers based around London, decided to hire a room at Rooks Heath School in South Harrow for a few Wednesday evenings to see what happened. Word of this wonderful music spread and chords could soon be heard echoing around the school each week as the embryonic chorus discovered the delights of tags and polecats. However, Christmas was fast approaching, which meant a break from Wednesday night rehearsals and the risk that the new singers would forget about this strange new hobby during the festive season. January soon arrived and the first Wednesday evening saw a queue of eager singers waiting to try this Barbershop lark again. It now looked like it was going to be feasible to officially form a new Barbershop Harmony Club with a name, a constitution, a committee, subs, and lots of administrative stuff to accompany the singing. 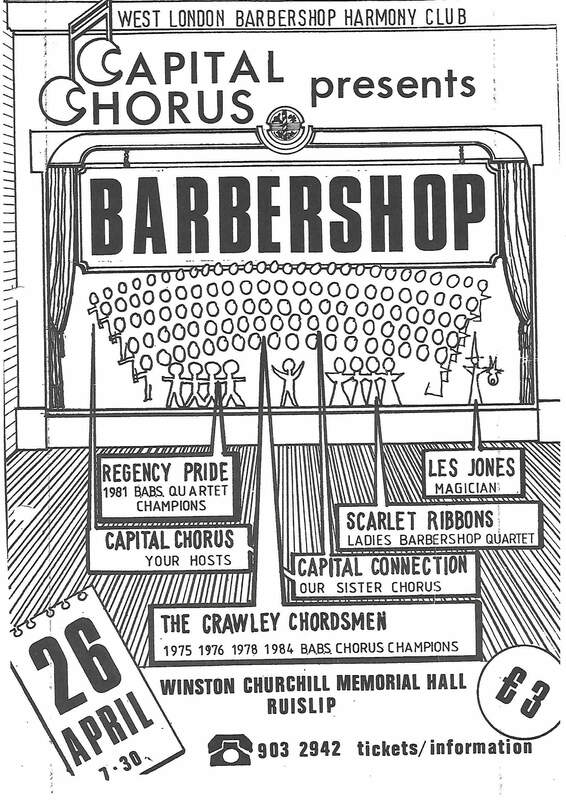 After thinking of various possible names for the new club and its chorus (including Harrow, Middlesex and London) “West London Barbershop Harmony Club” and “Capital Chorus” were decided upon. An exciting and vibrant club committee was formed, and on Monday, 13th February, the committee met at the Ballot Box public house to formally start our 35 year journey. By May 1984 the club was obviously a going concern, so an approach was made to BABS to apply for membership of this strange organisation, which seemed to be affiliated to a mysterious American group known as SPEBSQSA, which made it all seem slightly worrying to the uninitiated. However, a visit to one of our rehearsal evenings by John Wiggins on behalf of BABS put our minds at rest. He confirmed that we were singing good barbershop, had a proper club structure and constitution in place, and said if we’d like to give BABS some money a couple of times a year then we were in. We were officially welcomed to BABS with a “Chord of Accord” at their AGM on 23rd September, and the new singers all received BABS membership certificates in January 1985. Our first public performance was on Wednesday, 20th June, 1984. We were guests of the Lissenden Players for an Old Time Music Hall evening at Lauderdale House in Highgate, North London, and we sang an assortment of exciting songs. Other performances soon followed, including the first ever public outing of a quartet from the club, at a charity performance in Newham, East London. 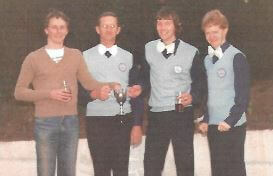 The quartet members were all part of the group of established barbershop singers who founded the club. 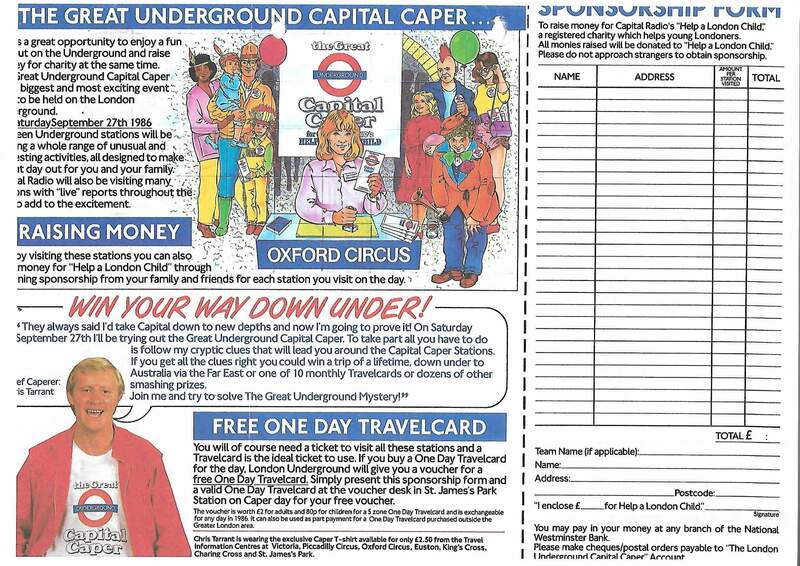 Capital Chorus became one of the first groups to legally perform on the London Underground when Capital Radio teamed up with London Transport to host “The Great Capital Underground Caper” on 27th September, 1986. Entertainments and events were held at 18 stations across the network in aid of the Help a London Child charity appeal. Capital Chorus sang at King’s Cross Station as part of the event and then may have gone on to do a bit of impromptu busking elsewhere…. For a few years we had close links with the American Society in London and the US Embassy in Grosvenor Square which brought about some very prestigious and extremely enjoyable performances. A regular event was the US ambassador’s 4th of July Garden Party at his official residence, Winfield House (known to its friends as Woolworths Towers) in Regents Park. We performed free of charge but were amply rewarded with an afternoon of spectacular entertainment and ceremony, as well as more free food and drink – including a doggy-bag – than we could possibly consume. Another American Highlight was the 1996 Election Night where we performed at the US Embassy until the early hours of the morning. Once again, the free food and drink came non-stop as we mingled with famous politicians, journalists and celebrities. Parts of our performance were broadcast on TV and radio news and current affairs programmes around the world. 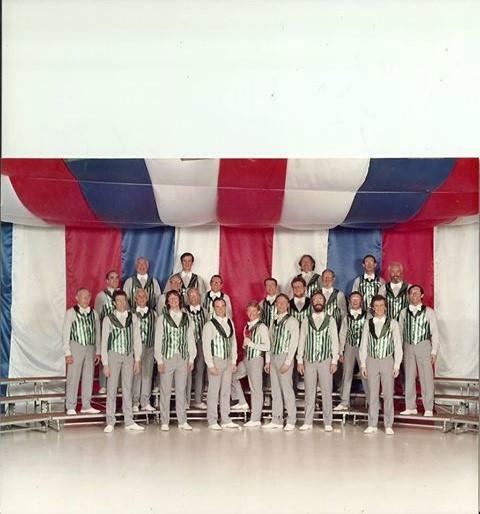 Music feastivals have always been a regular part of musical life at Capital Chorus. We’ve taken part in a number of local festivals and have often travelled around Southern England to participate. Winning at these festivals quickly became something of a habit for us and we have numerous awards to our name. Very occasionally there may be a second competitor in our class, which makes winning an award even more of an achievement! 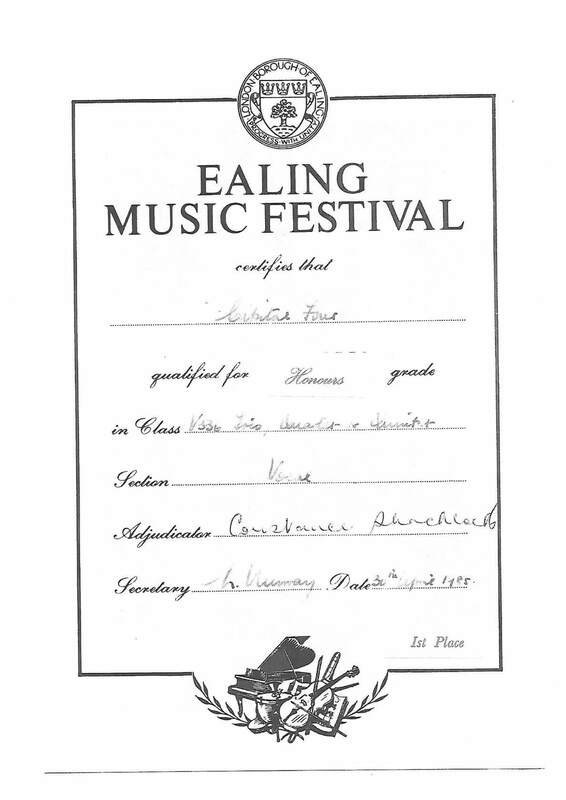 The first festival ever entered by members of the club was the 1985 Ealing Music Festival. 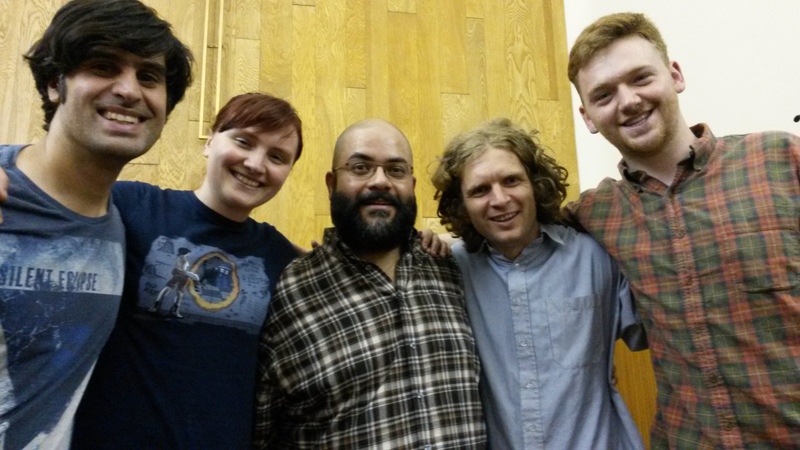 A quartet, Capital Four, got together for the first rehearsal at 6pm on Tuesday, 30th April. At 6,30 they were on stage and by 6,45 they received a winners’ trophy, having thrashed the two other competitors in the “trio, quartet or quintet” class. To say that the judges were extremely impressed would be something of an understatement, and to say that the quartet had a few beers afterwards would also be understating the facts ever-so-slightly…. High-quality coaching has always been something that Capital Chorus strives to offer its members. As a men's a cappella choir which sings unaccompanied, our voices need to be on-song, and as close to pitch-perfect as we can make them. ,The barbershop-style which we enjoy so much places a high value on bringing out the emotions in the songs we sing, and making them as entertaining and moving as we can for our audiences. So we were delighted when Rob Mance, one of North America's most renowned Barbershop chorus directors, agreed to join us for an evening in February to share some of his expertise. Born in Canada, Rob has spent the past seven years as director of the Kansas City barbershop chorus, Central Standard, taking them from 9th to 2nd place in the annual international contest held by America's Barbershop Harmony Society. His career has encompassed professional singing, coaching, music education at school and university level, and conducting ensembles from well beyond the Barbershop world. Apparently Rob first noticed Capital Chorus when he and Central Standard were invited as special guests to perform at last year's convention of the British Association of Barbershop Singers in Harrogate. 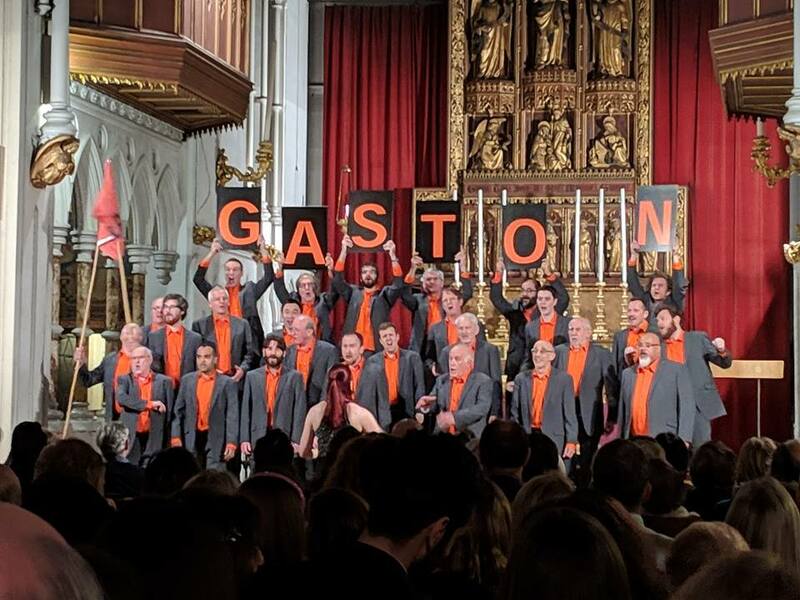 At the same event our chorus' rendition of Gaston was awarded the prize for the most entertaining barbershop performance., and it was seeing us there which encouraged him to spend an evening with us on his next visit to the UK. So what did we learn? Well, Rob spent a good deal of time helping us blend our voices to form a "wall of sound". He worked with us on some basic things like hitting the right note first time without wavering. He stressed to us the importance of supporting one another, For example, when one part was singing an embellishment to a song, it was important that the other three parts should sing as though they too were embellishing the score. Rob focused on the teamwork between a chorus and its director. The Director's job, he explained, was to hand the singers a big ball of energy which they could amplify and hand back. He was very complimentary about our own energetic musical director, Pippa Goodall, who was happy to accept some coaching tips of her own from Rob in front of the whole chorus. It's not every MD, he said, who'd be willing to do that. Most importantly, perhaps, he stresed to us that every rehearsal should be treated as though it was a performance. Inevitably, and happily, the evening ended with our guest accompanying us to the pub and continuing the conversation over a beer. Our thanks to Rob Mance for all his advice, experience and wisdom. We'll do our best to put what we've learned into practice as we prepare for a weekend-long singing retreat in April, and the next BABS convention in May. Capital Chorus has just enjoyed one of our busiest and most successful Christmas seasons in recent years. The highlight was surely a well-attended and highly enjoyable joint concert with our friends the Kensington Singers, held at the beautiful St Stephen's Church on Gloucester Road. The event raised funds for Chickenshed Kensington and Chelsea, whose young performers took to the stage and blew away the audience with a series of festive songs and humorous montages. 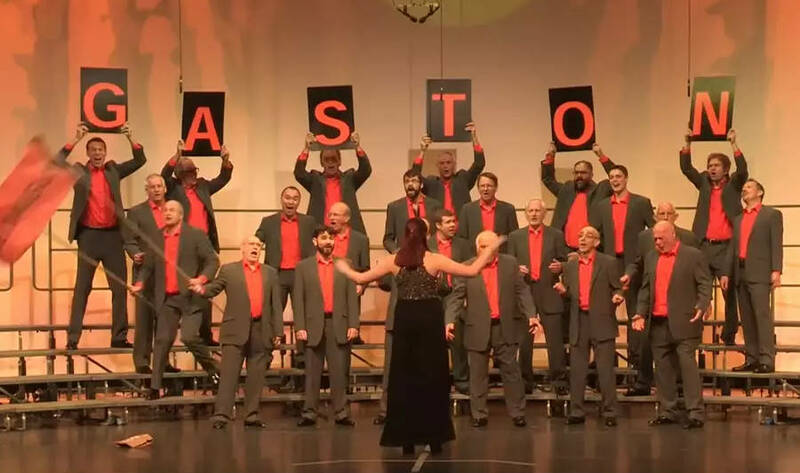 Our own singers had an opportunity to reprise the performance of "Gaston" which won us a trophy for the most entertaining chorus at BABS Convention last May,. Our a cappella style and the accompanied singing of the Kensington Singers provided a varied mix of musical styles, and the evening concluded with the two choirs combining for a spirited rendition of "We Wish You a Merry Christmas". We were also delighted to greet crowds on consecutive weekends who stopped to listen to us out and about in Sloane Square and West Ealing. We often wear our Christmas jumpers for these gigs. In West Ealing, our performance was followed immediately by a Christmas Jumper competition which one of our leads, Ian, was delighted to win! 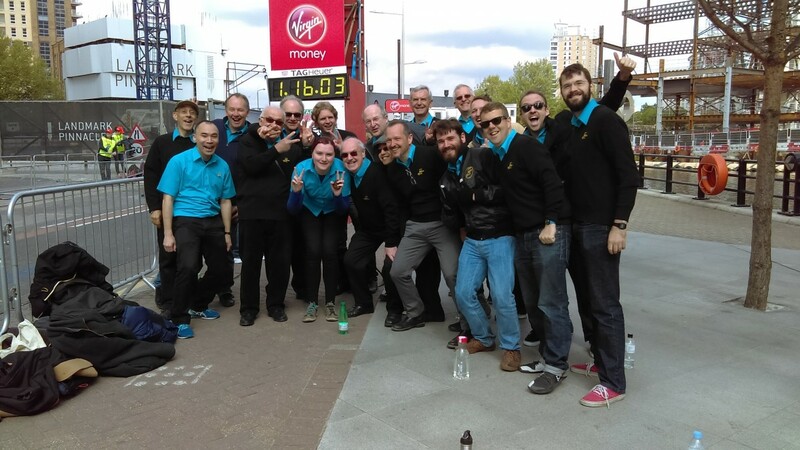 Looking ahead to 2019 we're already preparing for an annual appearance at the London Marathon in April, and a trip to the seaside in May for the annual convention of the British Association of Barbershop Singers. We wish you a Happy and Harmonious New Year. 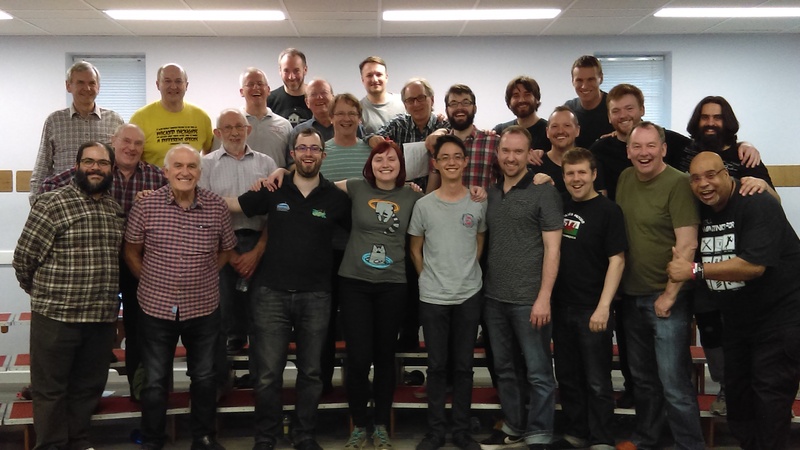 Last June Capital Chorus held a course to give the opportunity to those with an interest to find out about singing in close harmony, and, over six weeks, to give it a try. Four people enrolled, and we're delighted that, when the course ended, three of them decided to stay on and join the chorus. Raj (left) has joined the lead section. On the day of the Royal Wedding he was walking across Lammas Park when he spotted members of the chorus singing in the shade of a tree. He stopped to listen. We were promoting our course and Raj took a leaflet. A few moments later he texted to book his place. Rory (centre) had sung in choirs before, but he'd never tried Barbershop. When he spotted one of our posters while out and about in Ealing, he thought he'd give it a go. He's now a bass, helping out on the deepest, lowest notes. Terry (right) has joined our tenor section. He has a lively interest in choral music and song from around the world, and while travelling in the far east he sang with groups in Japan and Vietnam. Terry found our chorus online, and after the course he decided our style and our approach to singing could help him further develop his vocal skills. It's our great pleasure to have all three new members join us on the risers. They're all tremendous singers, and they seem to have taken to the fun and camaraderie of a chorus where we enjoy working together and supporting one another. We try not to take ourselves too seriously, but we always aim to perform to our best ability. Welcome All! The members of Capital Chorus are delighted to have returned from this year's British Association of Barbershop Singers' Convention in Harrogate having scooped one of the top awards. We were judged most entertaining chorus in the annual nationwide contest in which 36 choruses took part from all over Britain. We're especially pleased because the song which won us the title was arranged by our own multi-talented musical director Pippa Goodall, and was choreographed by chorus member Tom Fitch, who sings tenor. Taken from the film "Beauty and the Beast", "Gaston" is a rather tongue-in-cheek paean of praise to the movie's comically arrogant and macho character of the same name, and between them Pippa and Tom came up with plenty of comedic touches including bodybuilding moves, mock fights and even a spitting contest, which brought the audience to their feet. We should also thank Kirsty Williams for a weekend of inspirational coaching earlier this spring. Kirsty is a leading Barbershop and drama coach who had us all, by turn, laughing and crying as she helped us delve into the emotions and find the humour in the songs we'd chosen to sing. The "most entertaining" prize is awarded each year by judges from the Ladies Association of British Barbershop Singers, who wanted to encourage their male colleagues to impart more excitement and fun in their performances. The UK has separate Barbershop organisations for male and female singers. Capital Chorus was also placed as runner-up in the Small Chorus category, for groups with 25 singers or less. Altogether a weekend to remember. You can watch our two performace songs by following the links below. Sunshine, huge happy crowds, and the excitement of some of the world's top athletes racing past as we sang. 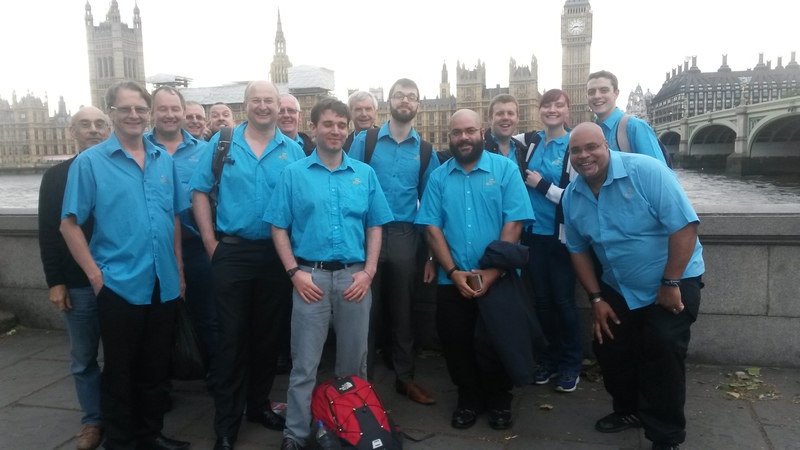 There's no doubt that the London Marathon is always one of Capital Chorus's favourite gigs. 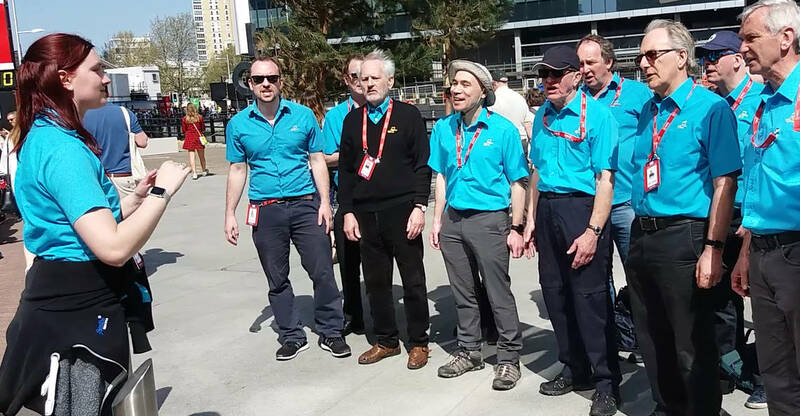 On Sunday April 22nd we were invited once again to spur on the competitors and entertain spectators in the heart of Docklands with some of our best-loved songs, all performed in the Barbershop Style. The day was almost as much of a marathon for the chorus as it was for the runners themselves. We gathered to warm-up at the roadside at 9am, then between 10am and 2pm we sang one set of songs per hour - five sets in total. With 14 songs in the full set, that amounted to well over 60 individual performances during the day. All that singing makes bottled water an absolute necessity for those involved, and a quick coffee grabbed between sets quickly becomes one of the delights of the day. We'll probably never find out whether, as he flashed by, Mo Farah felt urged onwards by our spirited rendition of "Hello Mary Lou" but we did receive many cheery waves from those further back in the race as they pounded past the 18 mile marker. It was a privilege to be able to offer encouragement and a pleasure to exchange a quick word with some who came over to say hello. The London Marathon was only the beginning of what will be an exciting and very demanding couple of months. Keep an eye out for our new "pop-up" quartets who'll be performing in some surprising places around West London as they spread the word about our latest Sing in Harmony Course, which begins on Monday June 4th at Kingsdown. Over the next six weeks we'll also be preparing in earnest for the annual contest to be staged at the end of May by the British Association of Barbershop Singers. For the first time this year we'll be singing two songs which have been specially arranged for us by Sam Hubbard and our own musical director, Pippa Goodall, Last year the chorus achieved 11th position, our highest ever placing. With 36 choruses competing in Harrogate this year we'll be determined to do our best once again. A big thank you to everyone who came to see Capital Chorus in concert on October 7th at St Michael and All Angels in Chiswick. It was wonderful to meet you, and to have the opportunity to perform for such an appreciative audience. Through your generosity our bucket collection after the show raised over £340 for the chorus's adopted charity, Nordoff Robbins. We would also like to thank Avalon and Sound Hypothesis, the two fabulous young quartets who appeared alongside us. You were amazing! After the show Avalon went on to win a bronze medal in the annual nationwide quartet competition held by the Ladies Association of British Barbershop Singers. Heartiest congratulations from all of us. It was more than just monkey-business. Incorporating ape-like sounds and gestures into a barbershop contest song was a real departure for the chorus, but we were determined to do it convincingly and sing the song well. After all, this was our biggest event of the year, the annual contest organised by the British Association of Barbershop Singers. The song in question was a David Wright arrangement of Disney's Jungle Book classic, "I wanna be like you"
While our musical director Pippa Goodall drilled us on the notes, Tom Fitch, one of our tenors, stepped forward to provide us with a humorous visual interpretation of the action in the song. Tom's choreography made for demanding and sometimes hilarious rehearsals, and we were delighted with the reaction we received from the 2000 convention-goers when we finally performed the song at the Bournemouth International Convention Centre at the end of May. IWBLY, as we've affectionately come to know the song, was preceded on the contest stage by a ballad, Robert Rudd's beautiful arrangement of "It's You". The two songs earned us our highest ever score from the judges, 68.2 per cent. The competition was hard-fought with 37 choruses taking part. Capital Chorus finished in 11th position, up four places on 2016. Next year we hope to do even better!. One of the highlights of the Capital Chorus year involves being invited to sing for runners and spectators at the London Marathon. It's happened for the past three years and whatever the weather it's always a day of excitement and surprises. Our preparations always begin with an early roadside warm-up at 9.15. This year we were placed in Docklands, beside the 18 mile marker, and our audience consisted of race-stewards and paramedics. It must have been odd for them to see 20 or more blue-shirted enthusiasts pop up on the pavement singing silly rounds and doing penguin jumps. But at least we were able to ease some of the pre-race tension and before long our warm-up had an appreciative audience of people decked out in official day-glo orange or yellow tabards. It's amazing how the excitement builds. First to come barrelling through at a tremendous pace are the elite wheelchair athletes. They're followed by more paralympians, then the elite non-disabled women and men, the club runners and finally the thousands of regular folks who've put their all into raising money for myriad good causes. Some have also put considerable effort into their imaginative costumes. We saw bright yellow emojis, several bears and a crocodile run by and that's before we'd been to the pub! It's a privilege to sing, to wave and cheer all the participants on towards the finish, and for the chorus it's a marathon performance in more than one sense. Our set list included ten of our most crowd-pleasing songs. This year we sang the entire set four times, with a break for take-away coffee between each performance, and the chance to shout some encouragement to the competitors. This year for the first time we started cheering on by name those who'd had their own names emblazoned on their shirts. Greg Nixon, one of our leads had recently run the Manchester Marathon and he told us that hearing spectators urge him on by name had given him a real lift - we hope we were able to do the same for others. For us, the stand-out moment of the 2017 marathon came when a man who'd just run by suddenly stopped, turned around and came back to film one of our songs on his phone. It must have added at least a couple of minutes to his time, but we hope he'll enjoy replaying the video he captured of us providing a spirited rendition of "Drunken sailor". The chorus would like to pay tribute to all those who put such amazing effort into running the London Marathon. It's one of the world's most spectacular sporting and community events and it was wonderful, as barbershoppers, to be included. We can barely wait for next year. Rarely have we appeared on such an unusual bill. The scene, the stairs of the reading room at the Wellcome Collection beside the busy Euston Road: The decor, medical models, skeletons, extensive tall bookshelves and a prototype x-ray machine. The occasion was a Friday night event called "Macho?" which was billed as an exploration of the complex science of masculinity. Along with the many serious gender-related topics under discussion there was a lot of fun. We followed hard-on-the-heels of a very competitive nappy-changing contest (worry not - dummies were used and no real babies were harmed). Elsewhere in the building a group of Drag-Kings were hosting a "Bromance Cabaret" . 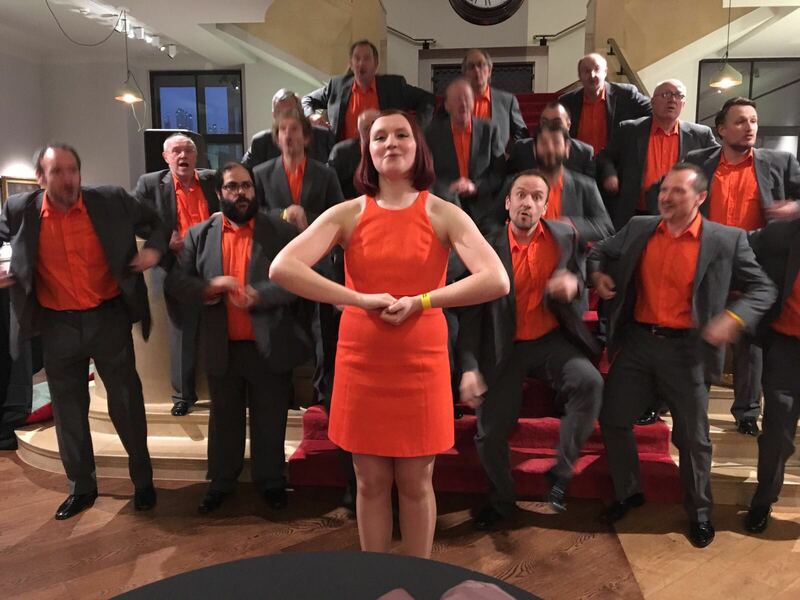 Capital Chorus was invited to sing as one example of a London male-voice choir, and we and Pippa, our female director received a tremendous response from an enthusiastic audience. We'd like to thank the Wellcome Collection for the opportunity to take part. You can watch a video of one of our songs here. Capital Chorus has just returned, tired but enthused from a weekend of intensive coaching at a hotel in deepest Buckinghamshire. It was part of our preparation for the annual British Association of Barbershop Singers convention in May. The weekend was certainly hard work, with two full days of expert tuition from one of the Barbershop World's most experienced directors and singers. Zac Booles is a gold-medalist with perhaps the UK's best-known quartet, The Great British Barbershop Boys, and he also directs Grand Central Chorus, one of the country's leading Barbershop ensembles. Needless to say Zac was ably assisted by our own MD Pippa Goodall. But if you're worried we might have worked too hard then rest assured there was a pool, a bar and some exceptional company with whom to relax after the rigours of the day. You can listen here to what went on during a very exciting weekend. We hope you'll enjoy it as much as we did. Text Me Merry Christmas - and send a selfie too! We love this comedy song, originally sung by the a cappella group Straight No Chaser, so as it's already December the whole chorus gatecrashed Santa's workshop and got busy. 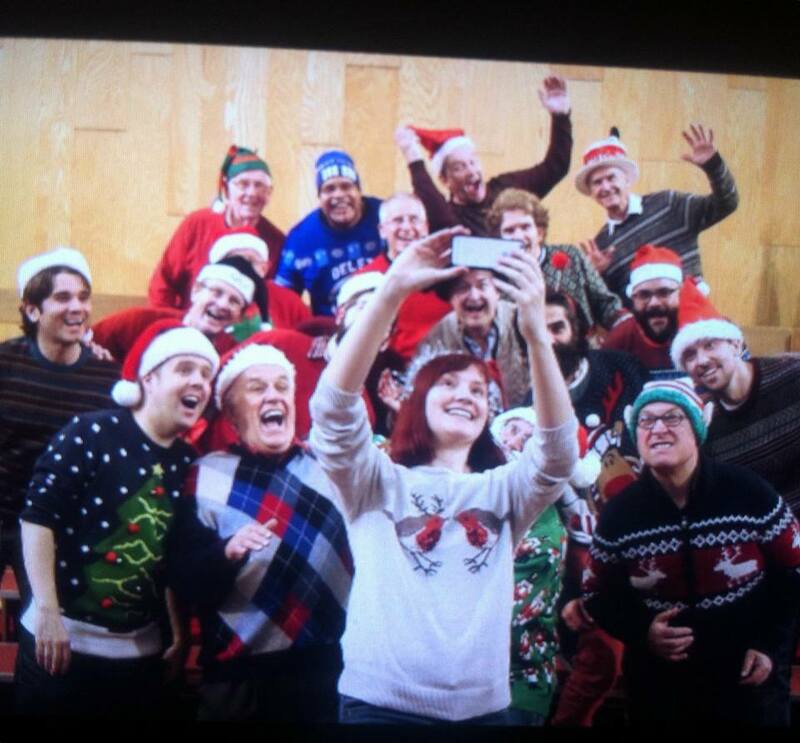 Under the direction of our chief elves Pippa (musical mayhem) and Greg (camera craft and technical wizardry) we recorded a video performance to wish all our friends, supporters and fellow barbershoppers a very Merry Christmas, and a 2017 filled with harmony, health and happiness. We hope it makes you smile. Exciting. Dazzling. Powerful. Unifying. I wouldn’t have described Barbershop singing in any of these ways before joining Capital Chorus. To me Barbershop seemed a little fusty, a genre from a bygone era, not one to appear in my Spotify playlists. Despite this I had a real desire to sing and became more open to exploring unfamiliar styles like Broadway and Gospel. As my tastes and confidence grew I came across a colourful flyer for Capital Chorus’ Learn To Sing course. It looked like a fun way to spend a Monday evening but it soon became the outlet for singing I had been looking for. Though I had no previous Barbershop experience, I was carried on a wave of enthusiasm from those in the Chorus and began enjoying the repertoire. It was a non-pressure environment with the benefit of safety in numbers, which meant the inevitable tongue trips and timing errors could be gradually overcome. As a baritone I started to learn how important it was to listen and blend with the other parts, and to regard the sound we created as a dynamic force which could have an emotional impact. I liked the idea that I could learn a polecat and use it as a bridge to connect us with people from other Choruses. I began to see I had underestimated Barbershop. To find that harmonic sweet spot, a lot of work is involved. In fact I still find myself having to dig deep to match the vigour fellow Chorus members bring to songs such as Ebb Tide or The Ballad of Springhill. To feel up to par I would listen to my Baritone part repeatedly through my headphones on long walks, drilling sections with the Chorus or taking part in rotating quartets. As i don’t read music, I had moments of feeling discouraged or overwhelmed, but this was eased by having supportive fellow Baris and a patient Musical Director to turn to for guidance. That’s part of the camaraderie of Barbershop - no one wants you to give up and you’ll still be asked to join a quartet at break time to sing a tag or two. So when it came to auditioning to become a fully fledged member of the Chorus, I was ready to take that step. Now that I’ve been part of the Chorus for nine months, I feel I can finally call myself a Barbershopper. Every Monday I find myself surrounded by talented people with a deep love of music and a wicked sense of fun. What started off as a hobby has evolved into membership of BABS and a memorable performance at this year's Convention in Harrogate. As I soon found out, no two performances are the same and we’ll only make it through together as a chorus, bringing an audience along with us on an emotional journey. So in the end really quite exciting, dazzling, powerful and unifying. You see it every day on the news - uncertain future, political turmoil, and the members of Capital Chorus are feeling it as much as everyone else. Like most groups of friends we had some lively discussions during the EU referendum, but we're fortunate to share a love of music and harmony, and it's helped us to keep in mind that, as the late MP Jo Cox said, there really is far more to unite us than divide us. It was while practising for a recent gig in Waterloo that some of our chorus members realised that the words of one song in our repertoire, called Nevertheless, seemed especially poignant in the current climate. Westminster was but a short walk from the performance venue so we decided to record the song opposite the Houses of Parliament and dedicate it to the 73 London MPs who, with their colleagues from all parties, are trying to map out a route to a better future for us all. After all, it's a tough job, and perhaps they could do with our support. You can watch the video below. We're delighted that several MPs responded with thanks after viewing the song. Some said it brought a smile to their faces and one even asked to be added to our mailing list for concerts. Needless to say, we'll be very happy to oblige. It's a busy time for the chorus at the moment - among our most recent performances was one for listeners to BBC Radio London 94.9. These days the average radio studio is far too small to accommodate the entire chorus, but our quartet "Slipstream" were able to squeeze in beside Saturday breakfast show hosts JoAnne Good and Simon Lederman to talk about our activities and provide a couple of songs. You can listen to our intrepid radio stars Paul Gordon (bass), Simon Laight (tenor). Patrick Key (lead) and Aidan Brand (baritone), along with our musical director Pippa Goodall here.